The Ardennes region of Belgium has, for centuries, produced natural coticule stones famous as high quality whetstones. Sought after by Straight Razor Sharpeners, Woodworkers, Carvers and Leather Workers, these natural stones are not as abundant as they once were. 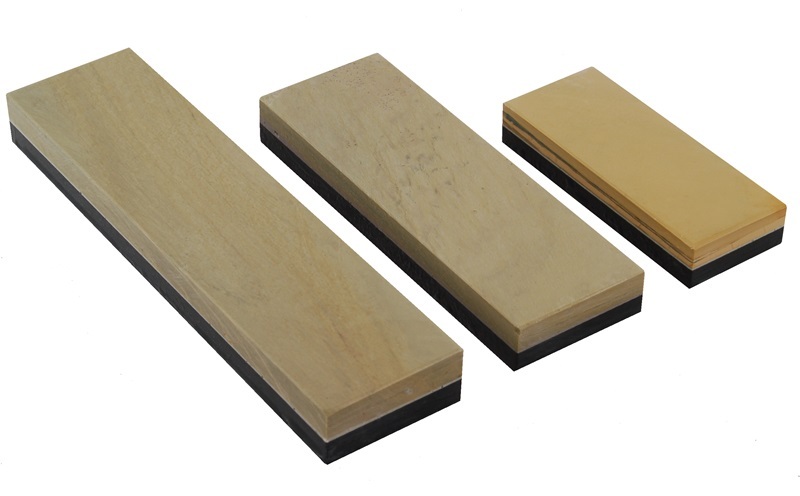 A single quarry is still in operation in Belgium, hand producing these wonderful natural sharpening stones. This particular type of whetstone is called a Coticule. They are characterized by a high concentration of spessartite garnets, and have a characteristic white-yellow color. They are fixed to a backing of blue-gray slate for stability. Coticules are somewhat brittle, and the slate backing prevents breakage. The slate is intended for structure only and is not used in the sharpening process. Note that Coticules are hand shaped, natural stones. The presence of hairline fractures is normal and not considered a defect. Some variance of size, color and exact composition is also normal. A. Yes. Wood Storage Boxes are available which fit both the Coticule Whetstones and the Belgian Blue Whetstones.